The Geneva Academy, represented by Sarah Gale, Annelies Nachtergaele and Clementine Rendle, won the prestigious 2016 Jean-Pictet Competition. It is the first time in the Geneva Academy’s history that it has won this prominent IHL moot. For this 2016 edition, the Competition received applications from 112 teams from 48 countries to compete in the prestigious event. Of these, 48 teams (32 anglophone and 16 francophone) were selected to participate in the final rounds of the Competition, held in Évian-les-Bains France. The Geneva Academy competed in a pool that included teams from India, USA, Ecuador, Israel and the Netherlands before progressing to the final against the University of New South Wales (Australia) and Université Grenoble Alpes (France). The final, presided over by former President of the International Criminal Tribunal for the former Yugoslavia Theodor Meron, concerned the question whether a fictional state party to the Rome Statute should transfer the leader of an armed group to the International Criminal Court for prosecution. The team - trained by Ilya Nuzov, teaching assistant at the Geneva Academy and PhD candidate at the University of Geneva - was split into three roles, each team member tasked with defending a particular position: the accused’s attorney against the motion; the national prosecutor in favour of the motion; and the ICC Office of the Prosecutor, also against the motion.  It was a tough task, requiring team members to argue against each other, but in the end the Geneva Academy team prevailed over the other finalists. Sarah Gale, Annelies Nachtergaele and Clementine Rendle are currently pursuing their LLM (Master of Advanced Studies in International Humanitarian Law and Human Rights) at the Geneva Academy. Sarah completed her Bachelors (2012) and Juris Doctor (2015) in Canada. During this time she worked in various legal positions in both post conflict societies and those in active conflict including Kenya and South Sudan. Annelies completed both her Bachelors and Masters of law in her home country, Belgium. After having graduated in 2014, she worked as a teaching assistant at the Institute for International and European Law of the KULeuven (Belgium). Clementine is an Associate in Litigation at Corrs Chambers Westgarth (Australia), where she has worked since graduating from the University of Sydney with a Bachelor of Laws (Hons) (2011) and Bachelor of International Studies (2009). The Jean-Pictet Competition is recognized as the leading international humanitarian law (IHL) competition and one of the most innovative training programmes for students in public international law. 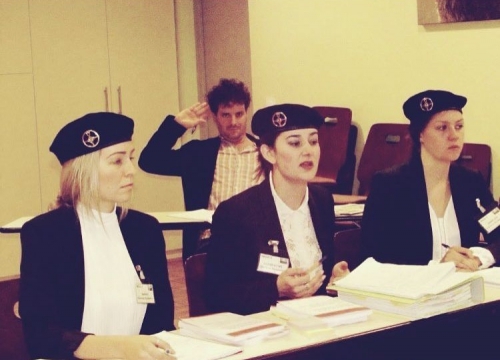 It is a week-long event that tests students on their knowledge of and ability to implement IHL, as well as other branches of international law, through role-playing exercises based on a hypothetical armed conflict scenario. The factual matrix, teams’ assigned roles and the assessment format evolve during the course of the week. For example, teams acted as ICRC delegates meeting to arrange humanitarian access, as a dissident armed group facing corruption allegations and as government departments defending their legal advice concerning the use of chemical weapons. The dynamic structure of the Competition encourages participants to consider IHL issues from various perspectives, while allowing the jury to evaluate each team's theoretical knowledge, practical understanding, and presentation style.